Over the last month, there have been a number of local news stories here in Austin, Texas about Presidential campaign signs as a symbol of free speech. The first one to break concerned University of Texas students Connor and Blake Kincaid (cousins) who shared a dorm room and decided to put Obama posters in their dorm window. They were told by university officials to remove the signs, as the school has a specific policy in place for more than ten years prohibiting the posting of political signs on windows or doors belonging to UT. The Kincaids refused to remove their signs and went public about the issue, claiming it denied them freedom of speech and enlisting the support of campus Republicans as well as Democrats. 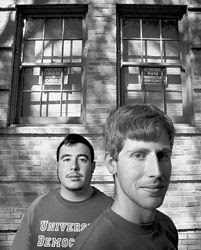 University of Texas students Blake Kincaid (left) and his cousin and roommate, Connor Kincaid, are seen outside their room at the Brackenridge Hall Dormitory in Austin, Texas. Photo by Jay Janner. Their tactic initially failed, however. The University held a swift administrative hearing and punished the cousins by barring them from registering for spring classes. News coverage of the fight intensified, with continued bipartisan support. TV stories showed representatives from campus Democrat and Republican groups urging all UT students to put a sign of their choice in their dorm window, thus forcing the school to hold thousands of disciplinary hearings. A day later the University of Texas decided to suspend its rule against displaying political signs in dorm windows pending review by a committee of students and staff. The Obama signs stayed up. A story from KEYE-TV on October 16th tried to depict the local yard sign vandalism as a bipartisan problem, but the last sentence of the story reveals "Austin police have received 29 calls about political signs stolen or vandalized in September and October. 19 of them were Obama signs, 5 were McCain, and 5 were unspecified." One Austin woman, Melissa Balsam, erected a replacement Obama sign above her American flag, at the ten-foot level. This too was stolen during daylight hours, so her current effort is "now affixed 20 feet off the ground, nailed down and duct-taped to her house." When an Obama supporter in another part of the country set up a surveillance camera to videotape whoever kept returning to his neighborhood to rip down all the Obama signs, that bit of film and interview was played over two cycles on all three local stations. Now, Shannon Bennett of Northwest Austin has made national news by her response to repeated theft of her Obama yard sign. 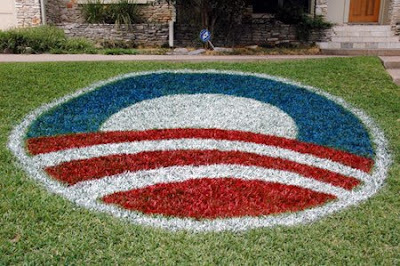 She purchased 12 cans of spray paint and created a permanent Obama symbol 14 feet across on her lawn. It's a work of art, and even her Republican neighbor admires it. Watch the story below for details. Creativity and insisting on your right to speak is an unbeatable combination.